These images were taken on August 21, 2014 at an aerobatics event hosted by the incredible members of the Team Oracle aerobatic flight team. 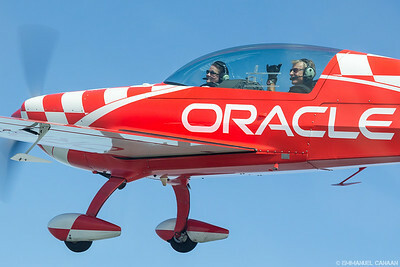 Chuck Coleman, an incredibly accomplished aviator, and member of Team Oracle, is seen here prepping to give me the photographic flight of my life. Our formation flight lines up on the runway at Flying Cloud Airport in Eden Prairie, Minnesota. The Team Oracle photo ship can be seen accelerating in the distance. Team Oracle seen here hard at work thrilling a group of riders. Each member of Team Oracle works incredibly hard to ensure for the safety of the riders they take up. If you're looking for examples of exemplary teamwork, look no further than this team. 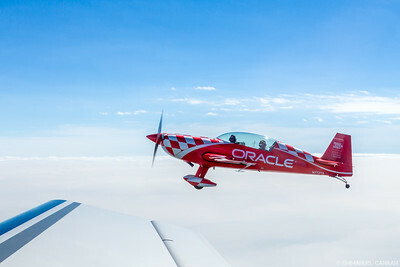 Team Oracle's photo ship, piloted by Chad Colberg, treats a group of photographers to a blissfully smooth ride while Sean D. Tucker and Chuck Coleman fly in tight formation. 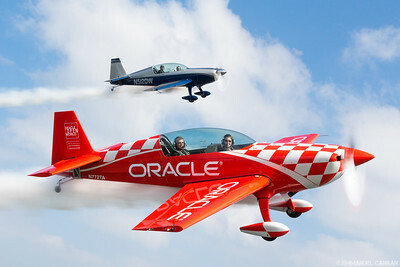 The masters of aerobatics at Team Oracle, treat riders to the flight of their lives over Minnesota. 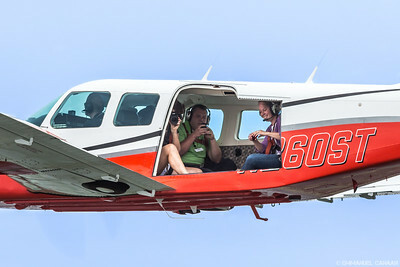 From the top: Chad Colberg piloting the Piper Seneca, Sean D. Tucker piloting the Extra 300L, and Chuck Coleman piloting his own Extra 300L from which I am shooting from. Team Oracle banks hard while seeking out pockets of sunlight on a cloudy Minnesota day. Clouds are never a barrier to a nice day for Team Oracle. 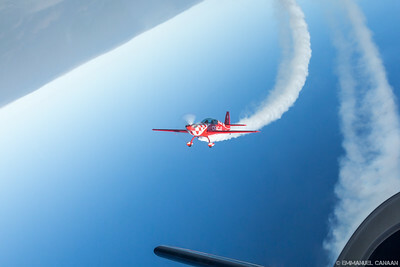 Seen here are Sean D. Tucker and Chuck Coleman climbing up through a break in the clouds over Minnesota. 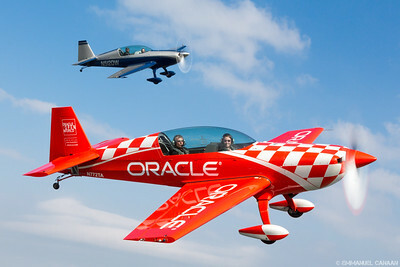 When in formation, the pilots of Team Oracle have a laser-like focus on the lead aircraft. Here Sean D. Tucker stares intently at my photo ship as Chuck Coleman deftly pilots it. 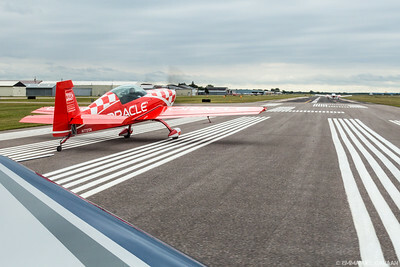 Sean D. Tucker powers Team Oracle's Extra 300L through a loop over Minnesota in tandem with Chuck Coleman's Extra 300L. The pilots of Team Oracle have some unusual attitudes about what direction planes should fly in. Sean D. Tucker is seen here pulling his Extra 300L through a loop over Minnesota while staying in perfect sync with Chuck Coleman's Extra 300L from which I am shooting from. The superstars of Team Oracle, Sean D. Tucker and Chuck Coleman, perform formation aerobatics over Minnesota. This image was taken from Chuck's Extra 300L. 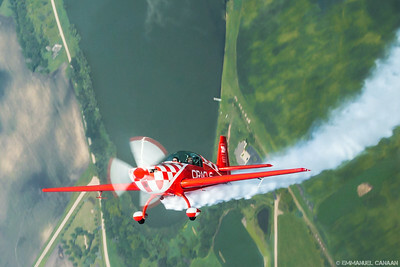 Sean D. Tucker reaches the apex of his loop over Minnesota while Chuck Coleman and I ride alongside. 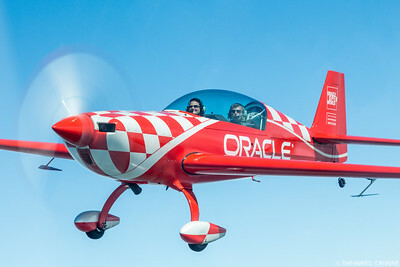 Chuck Coleman of Team Oracle takes me on an amazing ride in his Extra 300L while in formation with the aerobatic superstar Sean D. Tucker over the skies of Minnesota. 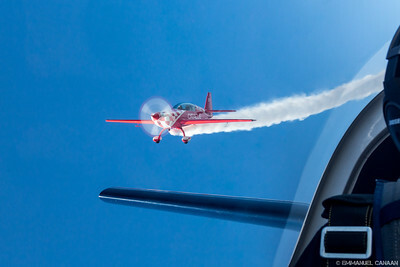 Sean D. Tucker and Chuck Coleman deftly maneuver their Extra 300L aircraft in a tight formation over Minnesota. Chuck Coleman wears many hats. 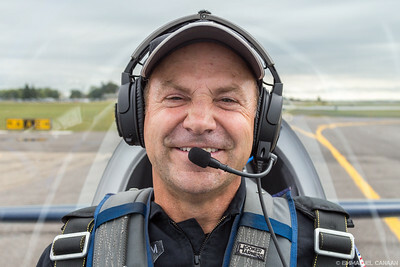 From Virgin Galactic instructor to airshow performer, Chuck is seen here wearing his Team Oracle hat while simultaneously posing and performing an aerobatic maneuver over Minnesota. Sean D. Tucker showing just how much he loves having the best job in the world, while giving a ride to a very lucky passenger. Sean D. Tucker and Chuck Coleman hold steady in their Extra 300L while the photographers in our photo ship (piloted by Chad Colberg) snap away. Sean D Tucker graciously gives me a big grin and a thumbs up at my request, as Chuck Coleman maintains a tight formation with Sean and our photo ship. 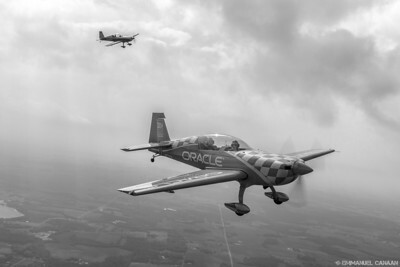 Sean D. Tucker and Chuck Coleman find some sun through a break in the clouds and use it to show off their beautiful flying machines. 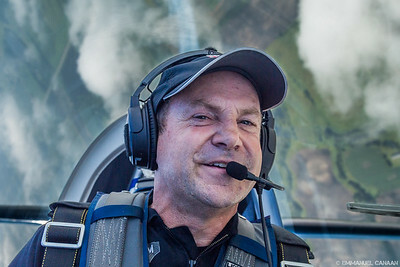 Sean D. Tucker is all smiles when the smoke is on as he and Chuck Coleman find some sun through a break in the clouds and use it to show off their beautiful flying machines. 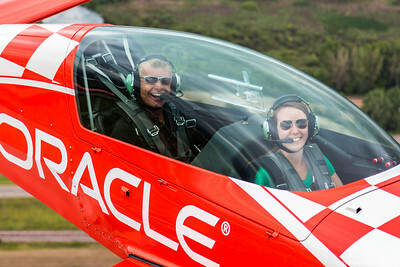 Sean D. Tucker and his lucky passenger can't help but smile big as they think about how amazing it is to fly! 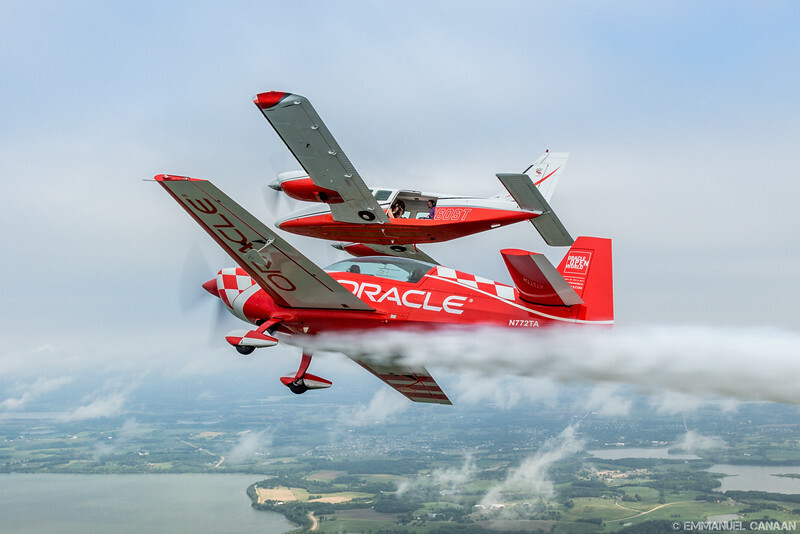 Sean D. Tucker and Chuck Coleman show off their impressive, spot-on ability to hold their aircraft in unusual attitudes while maintaining tight formation with our photo ship piloted by Chad Colberg. Sean D. Tucker and Chuck Coleman fly in formation just before our photo ship heads back to home base at Flying Cloud airport in Eden Prairie, MN. Thanks to Elliott Aviation for hosting us!